I just wanted to share a few simple things I've been enjoying this week. 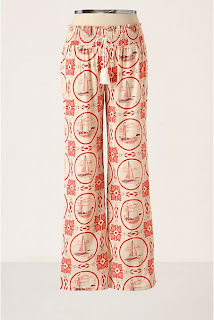 Given my deep love for being comfortable, I was such a happy girl when I found these fun, nautical themed jammie pants! And because I was so achy from the half marathon last weekend, they were perfect for lounging around at home. 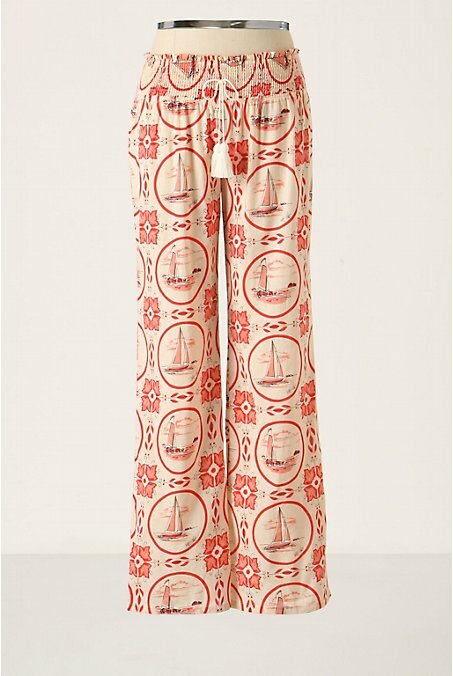 Wonderfully lightweight and great for the warmer weather! Homegrown roses straight from the garden! Let's be honest, they don't even compare to the store bought kind. They smell fantastic and have been going strong since Sunday! The past two weeks or so I have been getting my sweet fill from chocolate peanut butter. I mean, everyone knows chocolate and peanut butter are a match made in heaven! This was made by my mom in her Vita-Mix using only raw peanuts and a few dark chocolate chips, but if you don't prefer to make your own you might like Peanut Butter & Co.'s Dark Chocolate Dreams, or try grinding it yourself at Whole Foods! I personally enjoy it with fresh apple slices! Have a lovely Thursday and Happy Earth day!